IL-27 is a novel IL-12 family member that plays a role in the early regulation of Th1 initiation, induces proliferation of naive CD4+ T cells, and synergizes with IL-12 in IFN-γ production. It has been recently reported that IL-27 induces T-bet and IL-12Rβ2 expression through JAK1/STAT1 activation. In the present study, we further investigated the JAK/STAT signaling molecules activated by IL-27 and also the role of STAT1 in IL-27-mediated responses using STAT1-deficient mice. In addition to JAK1 and STAT1, IL-27-activated JAK2, tyrosine kinase-2, and STAT2, -3, and -5 in naive CD4+ T cells. The activation of STAT2 and STAT5, but not of STAT3, was greatly diminished in STAT1-deficient naive CD4+ T cells. Comparable proliferative response to IL-27 was observed between STAT1-deficient and wild-type naive CD4+ T cells. In contrast, IL-27 hardly induced T-bet and subsequent IL-12Rβ2 expression, and synergistic IFN-γ production by IL-27 and IL-12 was impaired in STAT1-deficient naive CD4+ T cells. Moreover, IL-27 augmented the expression of MHC class I on naive CD4+ T cells in a STAT1-dependent manner. These results suggest that IL-27 activates JAK1 and -2, tyrosine kinase-2, STAT1, -2, -3, and -5 in naive CD4+ T cells and that STAT1 plays an indispensable role in IL-27-induced T-bet and subsequent IL-12Rβ2 expression and MHC class I expression as well but not proliferation, while STAT3 presumably plays an important role in IL-27-induced proliferation. Cytokines play pivotal roles in the regulation of various biological responses including immune responses and inflammation. Most important, cytokine signal-transduction pathways are the JAKs and STATs (1, 2, 3). Immediately after receptor ligation by the cytokine, STATs are phosphorylated by JAKs, dimerized, and translocated into the nucleus, and modulate the expression of target genes. Each cytokine uses selective members of the JAK and STAT families to mediate its specific biological responses. Recently, a novel member of the IL-12 family was identified and termed IL-27 (4). IL-27 is a heterodimeric cytokine that consists of a p40-related protein, EBV-induced gene 3 (EBI3),3 and a newly discovered IL-12 p35-related protein, p28. IL-27 is produced by activated APCs, and is able to induce proliferation of naive but not memory CD4+ T cells and synergizes with IL-12 in IFN-γ production by naive CD4+ T cells (4). Previously, an orphan receptor designated type 1 cytokine receptor (TCCR; Ref.5) or WSX-1 (6) with similarity to the IL-12Rβ2 subunit was shown to be important for early initiation of Th1 responses. This receptor was then identified as one of the receptor subunits for IL-27, and is necessary, but not sufficient for IL-27 function (4). Notably, it is not necessary for the maintenance of Th1 responses although activation of TCCR or WSX-1 is required for the early initiation of Th1 responses (6). Therefore, IL-27 and IL-12 were considered to function sequentially in the initiation and maintenance of Th1 responses, respectively (4, 6). Consistent with this notion, it has been recently reported that IL-27 induces T-bet and subsequent IL-12Rβ2 expression, which is a key Th1 commitment step where naive Th precursor cells commence differentiation into Th1 cells, by naive CD4+ T cells through JAK1/STAT1 activation (7). However, in this report, only JAK/STAT signaling molecules that associate with one subunit of IL-27R, WSX-1/TCCR, were analyzed and identified by in vitro binding assay. 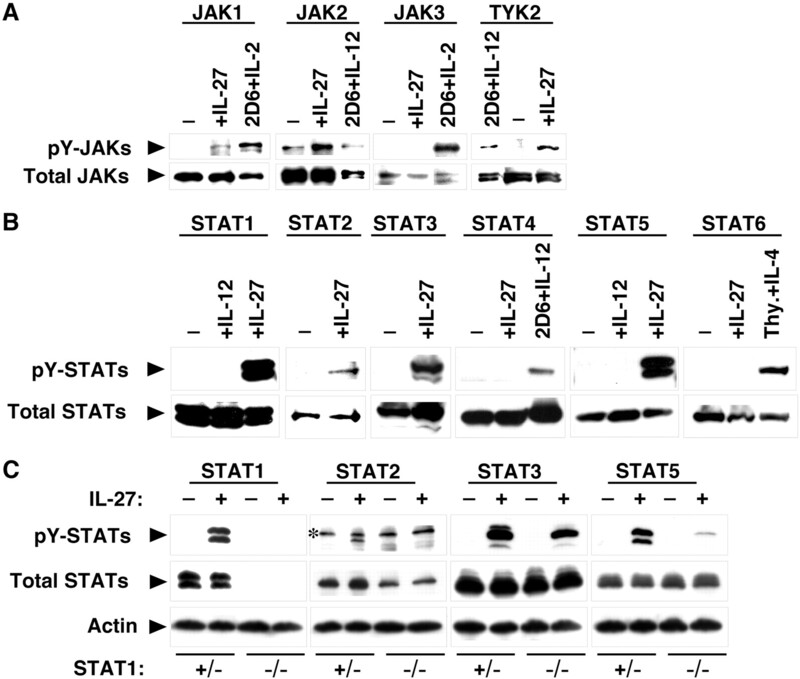 The other JAK/STAT signaling molecules activated by IL-27 remain unexplored. In the present study, we further investigated the JAK/STAT signaling molecules activated by IL-27 and also the role of STAT1 in IL-27-mediated responses using STAT1-deficient mice (8, 9). In addition to JAK1 and STAT1, we have found that IL-27 activates JAK2, tyrosine kinase (TYK)2, and STAT2, -3, and -5 in naive CD4+ T cells, and that STAT1 plays an indispensable role in IL-27-induced T-bet and subsequent IL-12Rβ2 expression and MHC class I expression as well but not proliferation, while STAT3 presumably plays an important role in IL-27-induced proliferation. Naive CD4+ T cells were cultured in RPMI 1640 medium supplemented with 10% FBS and 50 μM 2-ME. Human embryonic kidney 293-F cells were purchased from Invitrogen Life Technologies (Carlsbad, CA) and cultured in the serum-free medium (FreeStyle 293 Expression Medium; Invitrogen Life Technologies). IL-12-responsive mouse Th1 cell clone, 2D6, was kindly provided by Dr. H. Fujiwara (Osaka University, Osaka, Japan) and maintained in RPMI 1640 medium supplemented with 10% FBS, 50 μM 2-ME, and mouse rIL-12 (250 pg/ml). C57BL/6 mice were purchased from Japan SLC (Hamamatsu, Japan). STAT1-deficient mice (8) of 129/Sv background and wild-type 129/Sv mice were purchased from Taconic Farms (Germantown, NY). STAT1+/− and STAT1−/− mice (8) of a mixed background of 129/Sv and C57BL/6 were kindly provided by Dr. R. D. Schreiber (Department of Pathology and Immunology, Center for Immunology, Washington University School of Medicine, St. Louis, MO). All animal experiments were performed in accordance with our Institutional Guidelines. Anti-FLAG (M2) and anti-actin were purchased from Sigma-Aldrich (St. Louis, MO). Anti-CD3 (145-2C11), anti-IL-2 (S4B6), anti-IL-4 (11B11), and anti-MHC class I H-2, all haplotypes (M1/42.3.9.8.HLK) were from American Type Culture Collection (Manassas, VA). Mouse rIL-4, anti-IL-12Rβ2 (HAM10B9), anti-CD28 (37.51), anti-JAK1, and anti-TYK2 were from BD Biosciences (Franklin Lakes, NJ). Anti-JAK2 and -3, anti-phosphotyrosine (pY)-JAK-3, anti-STAT1, -3, -4, -5, and -6 and anti-T-bet (4B10) were from Santa Cruz Biotechnology (Santa Cruz, CA). Anti-STAT2 and anti-pY-STAT2 were from Upstate Biotechnology (Lake Placid, NY). Anti-pY-JAK1 and -2, anti-pY-TYK2, and anti-pY-STAT1, -3, -5, and -6 were from Cell Signaling Technology (Beverly, MA). Anti-pY-STAT4 was from Zymed Laboratories (San Francisco, CA). Mouse rIL-12 and -18 were from R&D Systems (Minneapolis, MN). Human rIL-2 and mouse rIFN-γ were kindly provided by Shionogi & Company (Osaka, Japan). Recombinant IL-27 was prepared as a soluble tagged fusion protein by flexibly linking EBI3 to p28, which was reported to show a similar activity to the naive heterodimeric complex (4). Mouse IL-27 EBI3 and p28 cDNAs were isolated by RT-PCR using total RNA prepared from Con A-activated spleen cells. For preparation of the single-chain (sc) IL-27 expression vector, fragments encoding the mature part of EBI3, followed by the (Gly4Ser)3 linker (10) and then by the mature coding sequence of p28 were generated by using standard PCR methods and cloned into p3xFLAG-CMV-9 (Sigma-Aldrich) vector, which has preprotrypsin signal peptide and 3xFLAG-epitope-tag sequences at N-terminal. Human embryonic kidney 293-F cells were then transiently transfected with the expression vector by using 293 fectin (Invitrogen Life Technologies) according to the manufacturer’s instructions. After 3 days, culture supernatant was harvested and 3xFLAG-tagged rscIL-27 was purified by affinity chromatography using anti-FLAG affinity gel (Sigma-Aldrich). Protein concentration of purified 3xFLAG-tagged rscIL-27 was determined by titration in Western blotting with anti-FLAG (M2) using 3xFLAG-tagged rscIL-12 prepared similarly as described above as a standard. The concentration of 3xFLAG-tagged rscIL-12 was determined using rIL-12 as a standard in ELISA as described previously (11). Primary T cells were purified by passing spleen cells depleted of erythrocytes through nylon wool. The flow-through fraction was incubated with biotin-conjugated anti-CD8α, anti-B220, anti-Mac-1, anti-Ter-119, and anti-DX5, followed by incubation with anti-biotin magnetic beads (Miltenyi Biotec, Bergisch Gladbach, Germany) and passed through a magnetic cell sorting column (Miltenyi Biotec), and the negative fraction was collected (CD4+ T cells >95%). CD4+ T cells were then incubated with anti-CD62L magnetic beads (Miltenyi Biotec), and the positive fraction was collected as purified naive CD4+ T cells (CD62L+ cells >99%). Cells were lysed in a lysis buffer containing protease inhibitors, and resultant cell lysates were separated on an SDS-PAGE under reducing conditions and transferred to polyvinylidene difluoride membrane (Millipore, Bedford, MA) as described previously (12). The membrane was then blocked, probed with primary Ab, and then with appropriate secondary Ab conjugated to HRP, and visualized with the ECL detection system (Amersham Biosciences, Little Chalfont, U.K.) according to the manufacturer’s instructions. For measurement of proliferation, purified naive CD4+ T cells (1 × 106 cells/ml) were stimulated with plate-coated anti-CD3 (145-2C11, 2 μg/ml) in the presence of rIL-27 and/or rIL-12 and anti-IL-2 (100 μg/ml) for 72 h and pulsed with [3H]thymidine for the last 24 h. For measurement of IFN-γ production, purified naive CD4+ T cells (1 × 106 cells/ml) were stimulated with plate-coated anti-CD3 (2 μg/ml) in the absence of rIL-27 and/or rIL-12 and anti-IL-2 (100 μg/ml) for 72 h, and culture supernatants were collected and assayed for IFN-γ production by ELISA as described (13). Total RNA was extracted by using a guanidine thiocyanate procedure, cDNA was prepared using oligo(dT) primer and SuperScript RT (Invitrogen Life Technologies), and RT-PCR was performed using TaqDNA polymerase as described (11). Cycle conditions were 94°C for 40 s, 60°C for 20 s, and 72°C for 40 s. Primers used for HPRT were described (14). The following primers were also used: T-bet sense primer, 5′-GATCGTCCTGCAGTCTCTCC-3′; T-bet antisense primer, 5′-AACTGTGTTCCCGAGGTGTC-3′; IL-12Rβ2 sense primer, 5′-ACTGTCAGAGAGCCAAGGAG-3′; and IL-12Rβ2 antisense primer, 5′-GTGCCCACCGTGATGATAG-3′. Purified naive CD4+ T cells (1 × 106 cells/ml) were stimulated with plate-coated anti-CD3 (2 μg/ml) in the presence of rIL-27 (1 ng/ml), rIL-12 (1 ng/ml), and anti-IL-2 (100 μg/ml) for 72 h. Stimulated cells were treated with GolgiStop (BD Biosciences) for 4 h before fixation and permeabilization with saponin. IFN-γ was detected using PE-conjugated anti-IFN-γ mAb (BD Biosciences) in combination with surface staining for CD4 (FITC-conjugated; BD Biosciences). Because JAK-STAT signaling molecules are critically important for signaling of various cytokines (1, 2, 3), we first examined what molecules among them were activated by IL-27. Purified naive CD4+ T cells were activated by plate-coated anti-CD3 in the presence of anti-IL-2 for 16 h, then washed and stimulated with IL-27 for 10 min. Total cell lysates were prepared and subjected to Western blotting using various anti-pY-JAKs and anti-pY-STATs (Fig. 1⇓, A and B). As reported previously (7), IL-27 induced activation of JAK1 and STAT1 in naive CD4+ T cells. In addition, JAK2, TYK2, and STAT3 and -5 were activated, and STAT2 was also slightly but constantly activated. As positive controls, cell lysates prepared from Th1 clone 2D6 cells stimulated with IL-12 or IL-2, or thymocytes stimulated with IL-4 were used. Consistent with the previous reports showing that IL-12 stimulates activated primary CD4+ T cells but not naive CD4+ T cells (4, 15), activation of STAT1 and STAT5 by IL-12 was not observed in naive CD4+ T cells (Fig. 1⇓B). We then examined whether these STATs were also activated by IL-27 in STAT1-deficient naive CD4+ T cells. As expected, STAT1 and tyrosine-phosphorylated STAT1 were not detected at all regardless of the stimulation by IL-27 (Fig. 1⇓C). In addition, activation of STAT2 and STAT5 was greatly reduced, while comparable activation of STAT3 was observed in STAT1-deficient naive CD4+ T cells. These results suggest that IL-27 activates JAK1 and -2, TYK2, and STAT1, -2, -3, and -5 in naive CD4+ T cells, and that STAT2 and STAT5 activation is presumably dependent on STAT1 but STAT3 activation is not dependent on it. Activation of JAK1 and -2, TYK2, and STAT1, -2, -3, and -5 by IL-27 in naive CD4+ T cells. Purified naive CD4+ T cells from wild-type C57BL/6 mice were stimulated by plate-coated anti-CD3 (2 μg/ml) in the presence of anti-IL-2 (100 μg/ml) for 16 h. After washing, the cells were stimulated with rIL-27 (10 ng/ml) for 10 min. Total cell lysates were then prepared and subjected to Western blotting with anti-pY-JAKs (A) or anti-pY-STATs (B). For verification of the same protein expression level, each blot was reprobed with anti-total JAKs (A) or anti-total STATs (B). As positive controls for pY-JAKs, pY-STAT4, and pY-STAT6, cell lysates prepared from 2D6 cells stimulated with rIL-2 or rIL-12 and from thymocytes (Thy) stimulated with rIL-4 were used, respectively. C, Purified naive CD4+ T cells from STAT1−/− or STAT+/− mice with a mixed background of C57BL/6 and 129Sv were stimulated as described above, and their total cell lysates were subjected to Western blotting with anti-pY-STATs, anti-total STATs, and anti-actin. ∗, A nonspecific band. Similar results were obtained in three to four independent experiments. We next examined the role of STAT1 in IL-27-induced responses using STAT1-deficient mice (8, 9). Because IL-27 induces proliferation of naive but not memory CD4+ T cells (4), we examined the proliferative activity of IL-27 to naive CD4+ T cells obtained from wild-type or STAT1-deficient mice. Purified naive CD4+ T cells were stimulated with plate-coated anti-CD3 in the presence of various concentrations of IL-27 for 72 h and pulsed with [3H]thymidine for the last 24 h. As reported previously (4), IL-27 greatly augmented the proliferation of naive CD4+ T cells from wild-type mice stimulated with plate-coated anti-CD3 in a dose-dependent manner (Fig. 2⇓). In STAT1-deficient naive CD4+ T cells, comparable proliferative response was observed (Fig. 2⇓). However, IL-12 minimally augmented the proliferation of naive CD4+ T cells from both wild-type and STAT1-deficient mice as reported (4). These results suggest that STAT1 does not play an important role in IL-27-induced proliferation of naive CD4+ T cells. 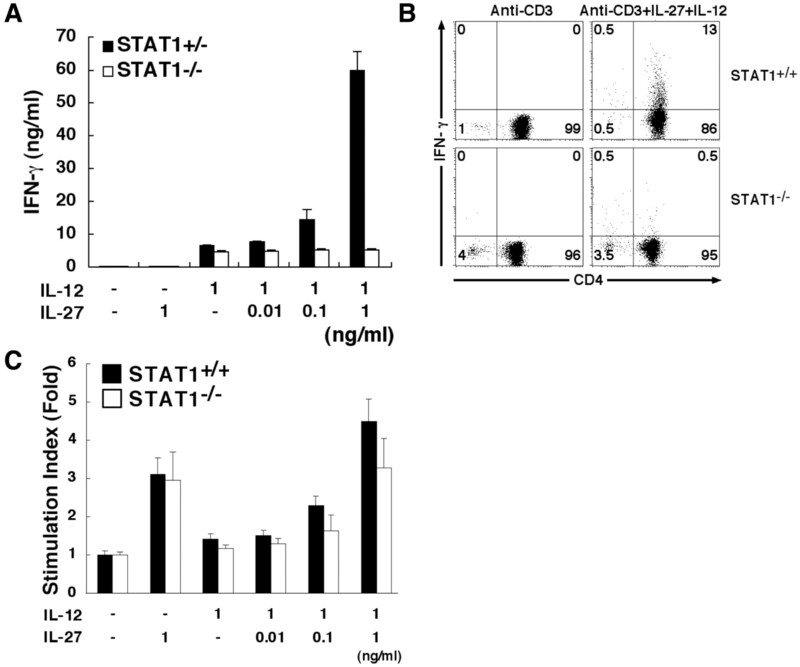 Comparable proliferative response of STAT1-deficient naive CD4+ T cells stimulated by IL-27. Purified naive CD4+ T cells from wild-type and STAT1-deficient mice were stimulated with plate-coated anti-CD3 (2 μg/ml) and rIL-27 (0.1, 1, and 10 ng/ml) in the presence of anti-IL-2 (100 μg/ml) for 72 h and pulsed with [3H]thymidine for the last 24 h. [3H]Thymidine incorporation was measured in triplicate, and the stimulation index was calculated. Data are shown as the mean ± SD of three independent experiments. When purified naive CD4+ T cells from wild-type and STAT1-deficient mice were similarly stimulated with plate-coated anti-CD3 (2 μg/ml) and rIL-12 (10 ng/ml) as described above, the stimulation indexes were 1.49 ± 0.11 and 1.11 ± 0.09, respectively. It was recently demonstrated that IL-27 induces T-bet and IL-12Rβ2 expression in naive CD4+ T cells (7). The expression of IL-12Rβ2, which is a critical step for Th1 development in CD4+ T cells during T cell activation (16), was previously demonstrated to be mediated by T-bet, which is induced by IFN-γ and STAT1 signaling (17, 18). Therefore, we next examined the expression of T-bet and IL-12Rβ2 in STAT1-deficient naive CD4+ T cells. Purified naive CD4+ T cells were stimulated with plate-coated anti-CD3 in the presence or absence of IL-27 for 24 h, and total RNA was prepared and subjected to RT-PCR. IL-27 greatly enhanced the expression of T-bet and IL-12Rβ2 mRNA in wild-type naive CD4+ T cells, whereas IL-27 minimally augmented it in STAT1-deficient naive CD4+ T cells (Fig. 3⇓A). Total cell lysate was then prepared from cells stimulated for 72 h as described above and subjected to Western blotting with anti-T-bet. Surface expression of IL-12Rβ2 on the stimulated naive CD4+ T cells was also determined by FACS analysis. Although IL-27 induced the T-bet expression in naive CD4+ T cells from wild-type mice at protein level, IL-27 hardly induced it from STAT1-deficient mice (Fig. 3⇓B). It was previously demonstrated that ectopic T-bet expression induces IL-12Rβ2 expression even in STAT1-deficient CD4+ T cells, indicating that IL-12Rβ2 expression is highly inducible by T-bet whose process does not depend on STAT1 (18). 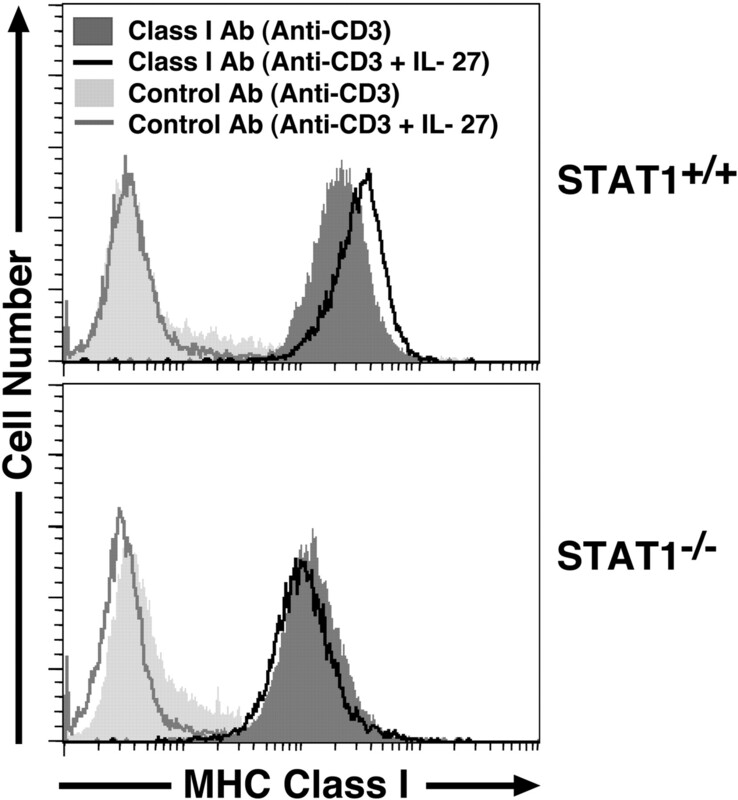 Consistent with the report (18), the surface IL-12Rβ2 expression was hardly induced by IL-27 on the stimulated naive CD4+ T cells from STAT1-deficient mice correlating with the abolished expression of T-bet, while its expression was efficiently induced on these cells from wild-type mice (Fig. 3⇓C). To rule out the possibility that naive CD4+ T cells from STAT1-deficient have an intrinsic defect in IL-12Rβ2 expression, we next examined IL-12Rβ2 expression on naive CD4+ T cells stimulated with plate-coated anti-CD3 and anti-CD28 under Th1 conditions including IL-12 and anti-IL-4 plus IL-18. Afkarian et al. (18) have previously demonstrated that STAT1 is conditionally required for maintaining IL-12Rβ2 expression only in the presence of IL-4, but not for induction of IL-12Rβ2 expression in the absence of IL-4 under Th1 conditions. Chang et al. (19) have previously shown greatly enhanced IL-12Rβ2 expression in T cells by a combined treatment with IL-12 and IL-18. Induction of IL-12Rβ2 expression on naive CD4+ T cells by IL-27 peaked at around 3 days after the stimulation, while that by IL-12 and IL-18 peaked later at around 4 days after the stimulation under our experimental conditions (data not shown). Consistent with these reports (18, 19), a significant induction of IL-12Rβ2 expression was observed on naive CD4+ T cells from STAT1-deficient mice under these Th1 conditions, although the induction level was slightly reduced as compared with wild-type mice in our experimental conditions (Fig. 3⇓D). Even under these conditions including anti-IL-4, IL-27 hardly induced IL-12Rβ2 expression on naive CD4+ T cells from STAT1-deficient mice, although the induction of IL-12Rβ2 expression by IL-27 wasobserved on naive CD4+ T cells from wild-type mice (Fig. 3⇓D). These results suggest that STAT1 plays a pivotal role in IL-27-induced T-bet and subsequent IL-12Rβ2 expression of naive CD4+ T cells. Impaired induction of T-bet and subsequent IL-12Rβ2 expression in STAT1-deficient naive CD4+ T cells stimulated by IL-27. A, Purified naive CD4+ T cells from wild-type and STAT1-deficient mice were stimulated with plate-coated anti-CD3 (2 μg/ml) and rIL-27 (5 ng/ml) in the presence of anti-IL-2 (100 μg/ml). After 24 h, total RNA was prepared and RT-PCR was performed. B, Total cell lysate was prepared after the stimulation for 72 h, and Western blotting with anti-T-bet and anti-actin was performed. C, These stimulated cells were also analyzed for cell surface expression of IL-12Rβ2 (solid line) or its irrelevant isotype-matched control (plain line with shading) by FACS. D, Purified naive CD4+ T cells from wild-type and STAT1-deficient mice were stimulated with plate-coated anti-CD3 (2 μg/ml) and anti-CD28 (0.5 μg/ml) and with or without rIL-27 (10 ng/ml) in the presence of anti-IL-4 (10 μg/ml) for 3 days. Purified naive CD4+ T cells were also stimulated with plate-coated anti-CD3 (2 μg/ml) and anti-CD28 (0.5 μg/ml) and with or without rIL-12 (20 ng/ml) plus rIL-18 (40 ng/ml) in the presence of anti-IL-4 (10 μg/ml) for 4 days. These stimulated cells were then analyzed for cell surface expression of IL-12Rβ2 (solid line) or its irrelevant isotype-matched control (plain line with shading) by FACS. Similar results were obtained in two to three independent experiments. Because IL-27 strongly synergizes with IL-12 in IFN-γ production by naive CD4+ T cells (7), we next examined the synergistic IFN-γ production of naive CD4+ T cells from STAT1-deficient mice. Purified naive CD4+ T cells were stimulated with plate-coated anti-CD3 in the presence of IL-27 and/or IL-12 for 72 h, and culture supernatants were collected and analyzed for IFN-γ production in ELISA. IL-27 alone did not induce the IFN-γ production from wild-type naive CD4+ T cells, but IL-27 greatly enhanced it in the presence of IL-12 in a dose-dependent manner (Fig. 4⇓A). However, the combination of IL-27 and IL-12 hardly induced the IFN-γ production from STAT1-deficient naive CD4+ T cells (Fig. 4⇓A), which is consistent with the results in Fig. 3⇑ showing an inability of IL-27 to induce IL-12Rβ2 expression on STAT1-deficient naive CD4+ T cells. Because naive CD4+ T cells do not respond to IL-12 (4), a small amount of IFN-γ production observed in response to IL-12 alone might be due to a contamination of other cells (<5%). The inability to produce IFN-γ of STAT1-deficient naive CD4+ T cells in response to the combination of IL-27 and IL-12 was also confirmed by an intracellular staining of IFN-γ (Fig. 4⇓B). In contrast, IL-27, but not IL-12, alone efficiently induced proliferation of naive CD4+ T cells activated with plate-coated anti-CD3, while the combination of IL-27 and IL-12 slightly but not synergistically augmented the proliferation as compared with IL-27 alone regardless of the presence of STAT1 (Fig. 4⇓C). These results suggest that STAT1 plays a critical role in IL-27-mediated synergistic IFN-γ production with IL-12 of naive CD4+ T cells. 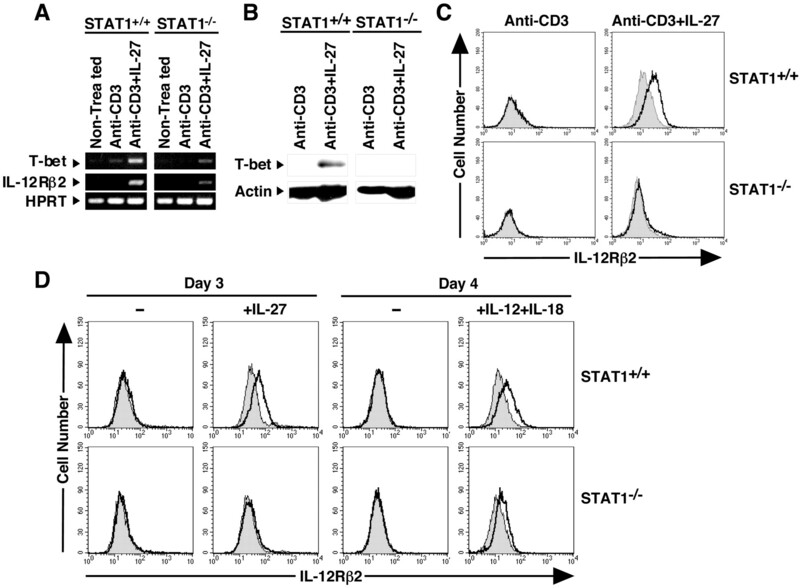 Impaired synergistic IFN-γ production with IL-12 of STAT1-deficient naive CD4+ T cells stimulated by IL-27. Purified naive CD4+ T cells from wild-type or STAT+/− mice and STAT1-deficient mice were stimulated with plate-coated anti-CD3 (2 μg/ml), rIL-27 (0.01, 0.1, and 1 ng/ml) and/or rIL-12 (1 ng/ml) in the presence of anti-IL-2 (100 μg/ml). A, After the stimulation for 72 h, culture supernatants were collected and assayed for IFN-γ production by ELISA in triplicate. Data are shown as the mean ± SD. Similar results were obtained in three independent experiments. B, Flow cytometric analysis of intracellular IFN-γ staining was also performed in combination with surface staining for CD4, when rIL-27 (1 ng/ml) and rIL-12 (1 ng/ml) were used. Similar results were obtained in three independent experiments. C, These cells, stimulated for 72 h, were also pulsed with [3H]Thymidine for the last 24 h. [3H]thymidine incorporation was measured in triplicate, and stimulation index was calculated. Data are shown as the mean ± SD of three independent experiments. MHC class I expression is important for immune recognition of virus infection and for T cell development. MHC class I is constitutively expressed yet highly induced by type I and II IFN, whose processes are dependent on STAT1 (8). Therefore, we finally examined the effect of IL-27 on MHC class I expression on naive CD4+ T cells. Purified naive CD4+ T cells from wild-type or STAT1-deficient mice were stimulated with plate-coated anti-CD3 in the presence of IL-27 or IFN-γ as positive control for 72 h, and then analyzed for cell surface expression of MHC class I by FACS. As reported (20), MHC class I expression was enhanced by IFN-γ on wild-type naive CD4+ T cells (data not shown). Similarly, the MHC class I expression was slightly but constantly augmented by IL-27 (Fig. 5⇓). On STAT1-deficient CD4+ T cells, the constitutive expression level of MHC class I was reported to be less than that on wild-type CD4+ T cells (Ref.20 ; Fig. 5⇓). The MHC class I expression was hardly augmented by IL-27 on STAT1-deficient naive CD4+ T cells (Fig. 5⇓). These results suggest that IL-27 augments MHC class I expression on naive CD4+ T cells in a STAT1-dependent manner. Augmentation of MHC class I expression by IL-27 in a STAT1-independent manner. Purified naive CD4+ T cells from wild-type and STAT1-deficient mice were stimulated with plate-coated anti-CD3 (2 μg/ml) and rIL-27 (5 ng/ml) in the presence of anti-IL-2 (100 μg/ml). After 72 h, these stimulated cells were analyzed for cell surface expression of MHC class I or its irrelevant isotype-matched control by FACS. Similar results were obtained in three independent experiments. Establishment of high-level IFN-γ production by activated CD4+ T cells is important in determining the course of infections and disease. T-bet is a crucial regulator of the process of IFN-γ gene activation in naive CD4+ T cells, leading to induction of a key component of the receptor for IL-12, IL-12Rβ2 (18, 21). This receptor signals predominantly through STAT4 and probably does not directly activate STAT1, yet STAT1 appears more important for T-bet induction than STAT4 (18). Therefore, it is important to understand what are the key physiologic inducers of T-bet in naive CD4+ T cells. In the present study, we have demonstrated that IL-27 activates JAK1 and -2, TYK2, and STAT1, -2, -3, and -5 in naive CD4+ T cells and that STAT1 plays an indispensable role in IL-27-induced T-bet and subsequent IL-12Rβ2 expression and MHC class I expression as well but not proliferation, while STAT3 presumably plays an important role in IL-27-induced proliferation. Very recently, similar activation of STAT3 as well as STAT1 by IL-27 was reported in human PBL (22). Previously it was demonstrated that T-bet is induced by IFN-γ and STAT1 signaling during T cell activation, resulting in Th1 development including the induction of IL-12Rβ2 expression (18). Consistent with this report (18) and also the recent report (7), the present results further provide a mechanistic insight into IL-27 acting as a potentially initiating cytokine to augment T-bet expression in Th1 differentiation early after T cell activation through STAT1 activation, before IL-12/IL-18. Therefore, even in the absence of IFN-γ, IL-27 would be possible to induce T-bet and trigger the later events. Moreover, we have recently demonstrated that IL-27 has a potent anti-tumor effect by augmenting CTL activity and IFN-γ production of spleen cells (15). However, it was previously demonstrated that EBI3-deficient mice exhibit a reduced number of invariant NKT cells, a sustained decrease in IL-4 production, and are resistant to Th2-mediated immunopathology associated with oxazolone-induced colitis (23). IFN-γ production was only transiently decreased in EBI3-deficient mice. These data may suggest that an EBI3-dependent factor different from IL-27 is involved in IL-4-mediated Th2 responses. Further studies with p28-deficient mice would be necessary to clarify the critical role of IL-27 in the initiation of Th1 differentiation. During the process to revise this manuscript, Lucas et al. (24) has reported as to the dependency on STAT1 in IL-27-induced responses using STAT1-deficient mice. Their conclusion is slightly different from ours in the point that T-bet induction by IL-27 is mediated through a STAT1-independent pathway. This discrepancy may be attributed to the experimental conditions, that is, they used primary CD4+ T cells but not naive CD4+ T cells and analyzed the T-bet expression at only mRNA level. We have recently found that primary spleen B cells are also responsive to the stimulation by IL-27 and that IL-27 induces T-bet expression in these B cells and the T-bet induction is greatly reduced at both mRNA and protein levels in STAT1-deficient spleen B cells (43). These results further support our conclusion that the T-bet induction by IL-27 is highly dependent on STAT1. Afkarian et al. (18) have previously investigated the requirement of STAT1 for Th1 development and induction of IL-12Rβ2 expression, and found that STAT1 is only conditionally required for them. They showed that IL-12-treated wild-type T cells induce IL-12Rβ2 expression by day 2 and maintain expression on day 7 with or without neutralization of IL-4. In contrast, STAT1-deficient T cells express IL-12Rβ2 in the presence of IL-12 either with or without neutralization of IL-4, but expression is maintained at day 7 only with neutralization of IL-4. Thus, IL-12Rβ2 expression is seen in Th1 cells derived from even STAT1-deficient mice. Chang et al. (19) have previously demonstrated that T cells stimulated with anti-CD3 and IL-18 express IL-12Rβ2 and the combination of IL-12 and IL-18 has a synergistic effect in up-regulating IL-12Rβ2 expression. Indeed, we could see a significant expression of IL-12Rβ2 on even STAT1-deficient naive CD4+ T cells stimulated with anti-CD3 and anti-CD28 under Th1 conditions including IL-12 and anti-IL-4 plus IL-18, although the expression level was slightly decreased as compared with wild-type naive CD4+ T cells (Fig. 3⇑D). This decrease might be due to the different stimulation conditions: antigenic stimulation using T cells derived from TCR-transgenic mice (18) vs polyclonal stimulation with anti-CD3 in the present study, or due to the insufficient amounts of anti-IL-4 we used. These results could rule out the possibility that STAT1-deficient naive CD4+ T cells have an intrinsic defect in IL-12Rβ2 expression, which is consistent with the previous report by Afkarian et al. (18). Even in these conditions including anti-IL-4, IL-27 failed to induce IL-12Rβ2 expression on STAT1-deficient naive CD4+ T cells stimulated with anti-CD3 and anti-CD28, although IL-27 induced IL-12Rβ2 expression on wild-type naive CD4+ T cells (Fig. 3⇑D). Thus, although further studies might be necessary to draw definitive conclusions, these results suggest that STAT1 is important for IL-27-induced IL-12Rβ2 expression, but less and conditionally important for IL-12 (plus IL-18)-induced IL-12Rβ2 expression, on naive CD4+ T cells. The JAK/STAT signaling pathway is most important for mediating biological responses induced by many cytokines (1, 2, 3). Selective usage of members of the JAK and STAT families by a given cytokine receptor is considered to be responsible for the specificity of cytokine action. However, cytokines that promote distinct cellular responses often activate identical STATs. Many cytokines including IL-6 and IL-10 that induce biological responses that are distinct from those induced by IFN-αβγ were shown to activate STAT1 (25, 26). However, the generation and characterization of mice deficient in STAT1 revealed that STAT1 signaling is essential for IFN-αβγ but not for IL-6 and IL-10 (8, 9). As JAK/STAT signaling molecules, IFN-αβ use JAK1, TYK2, STAT1 and -2, and IFN-γ uses JAK1 and -2 and STAT1 (3, 27, 28, 29, 30, 31, 32). Notably, these patterns are similar to that activated by IL-27 as shown here. In addition, it has been very recently demonstrated that gp130, which is shared among receptors for IL-6 and the other IL-6 family cytokines, is another subunit for IL-27R in addition to WSX-1/TCCR (33). IL-6 activates JAK1 and -2, TYK2, STAT1, and in particular STAT3 (34, 35, 36), whose pattern is also similar to those activated by IL-27. If two cytokines activate the same JAK/STAT signaling molecules, it is reasonable to expect similar biological actions between them. For example, both IL-4 and IL-13 activate STAT6 and induce IgE production (3). Indeed, IL-27 has been recently shown to induce T-bet and IL-12Rβ2 expression (7) as IFN-γ does (16, 17). If IL-27 could mimic IFN-αβγ and IL-6, then the expression pattern of their receptors will be important. WSX-1/TCCR and gp130 appear to be expressed on a variety of cells and tissues (5, 33). Therefore, it is highly possible to expect that IL-27 may have other biological actions similar to IFN-αβγ and IL-6, which remains to be elucidated. IFN-γ is a pleiotropic cytokine involved in antiproliferative responses, immune surveillance, and tumor suppression (37, 38). IFN-αβ is expressed by most if not all cells in response to virus infection, can be secreted in large amounts by plasmacytoid pre-DCs after contact with virus, and exerts a potent antiviral activity (39, 40). Highly increased susceptibility of STAT1-deficient mice to infection by microbial pathogens and viruses, which was demonstrated previously (8, 9), might be partly due to a lack of responsiveness to IL-27 in addition to IFN-αβγ. IL-6 is a cytokine that affects a variety of biological functions including Ig production, acute-phase reaction, and inflammation (41, 42). Mice deficient in gp130 show embryonic lethality, which might be partly caused by the abolished responsiveness to IL-27 as well. Thus, IL-27 may be a quite unique cytokine, which potentially has similar biological actions to IFN-αβγ and IL-6 in STAT1- and STAT3-dependent manners, respectively. We thank Drs. R. Schreiber, H. Fujiwara, and E. Takada for STAT1-deficient mice, 2D6 cell line, and technical help, respectively. ↵1 This study was supported by a grant-in-aid for Scientific Research from the Japanese Ministry of Education, Science, Sports and Culture. ↵3 Abbreviations used in this paper: EBI3, EBV-induced gene 3; TCCR, type 1 cytokine receptor; TYK, tyrosine kinase; pY, phosphotyrosine; sc, single-chain. Ihle, J. N.. 1996. STATs: signal transducers and activators of transcription. Cell 84:331. Darnell, J. E., Jr. 1997. STATs and gene regulation. Science 277:1630. Leonard, W. J., J. J. O’Shea. 1998. Jaks and STATs: biological implications. Annu. Rev. Immunol. 16:293. Meraz, M. A., J. M. White, K. C. Sheehan, E. A. Bach, S. J. Rodig, A. S. Dighe, D. H. Kaplan, J. K. Riley, A. C. Greenlund, D. Campbell, et al 1996. Targeted disruption of the Stat1 gene in mice reveals unexpected physiologic specificity in the JAK-STAT signaling pathway. Cell 84:431. Durbin, J. E., R. Hackenmiller, M. C. Simon, D. E. Levy. 1996. Targeted disruption of the mouse Stat1 gene results in compromised innate immunity to viral disease. Cell 84:443. Belladonna, M. L., J. C. Renauld, R. Bianchi, C. Vacca, F. Fallarino, C. Orabona, M. C. Fioretti, U. Grohmann, P. Puccetti. 2002. IL-23 and IL-12 have overlapping, but distinct, effects on murine dendritic cells. J. Immunol. 168:5448. Yoshimoto, T., Y. Takahama, C. R. Wang, T. Yoneto, S. Waki, H. Nariuchi. 1998. A pathogenic role of IL-12 in blood-stage murine malaria lethal strain Plasmodium berghei NK65 infection. J. Immunol. 160:5500. Yoshimoto, T., M. Furuhata, S. Kamiya, M. Hisada, H. Miyaji, Y. Magami, K. Yamamoto, H. Fujiwara, J. Mizuguchi. 2003. Positive modulation of IL-12 signaling by sphingosine kinase 2 associating with the IL-12 receptor β1 cytoplasmic region. J. Immunol. 171:1352. Yoneto, T., S. Waki, T. Takai, Y. Tagawa, Y. Iwakura, J. Mizuguchi, H. Nariuchi, T. Yoshimoto. 2001. A critical role of Fc receptor-mediated antibody-dependent phagocytosis in the host resistance to blood-stage Plasmodium berghei XAT infection. J. Immunol. 166:6236. Reiner, S. L., S. Zheng, D. B. Corry, R. M. Locksley. 1993. Constructing polycompetitor cDNAs for quantitative PCR. J. Immunol. Methods 165:37. Hisada, M., S. Kamiya, K. Fujita, M. L. Belladonna, T. Aoki, Y. Koyanagi, J. Mizuguchi, T. Yoshimoto. 2004. Potent antitumor activity of interleukin-27. Cancer Res. 64:1152. Szabo, S. J., A. S. Dighe, U. Gubler, K. M. Murphy. 1997. Regulation of the interleukin (IL)-12Rβ2 subunit expression in developing T helper 1 (Th1) and Th2 cells. J. Exp. Med. 185:817. Chang, J. T., B. M. Segal, K. Nakanishi, H. Okamura, E. M. Shevach. 2000. The costimulatory effect of IL-18 on the induction of antigen-specific IFN-γ production by resting T cells is IL-12 dependent and is mediated by up-regulation of the IL-12 receptor β2 subunit. Eur. J. Immunol. 30:1113. Lee, C. K., R. Gimeno, D. E. Levy. 1999. Differential regulation of constitutive major histocompatibility complex class I expression in T and B lymphocytes. J. Exp. Med. 190:1451. Hibbert, L., S. Pflanz, R. De Waal Malefyt, R. A. Kastelein. 2003. 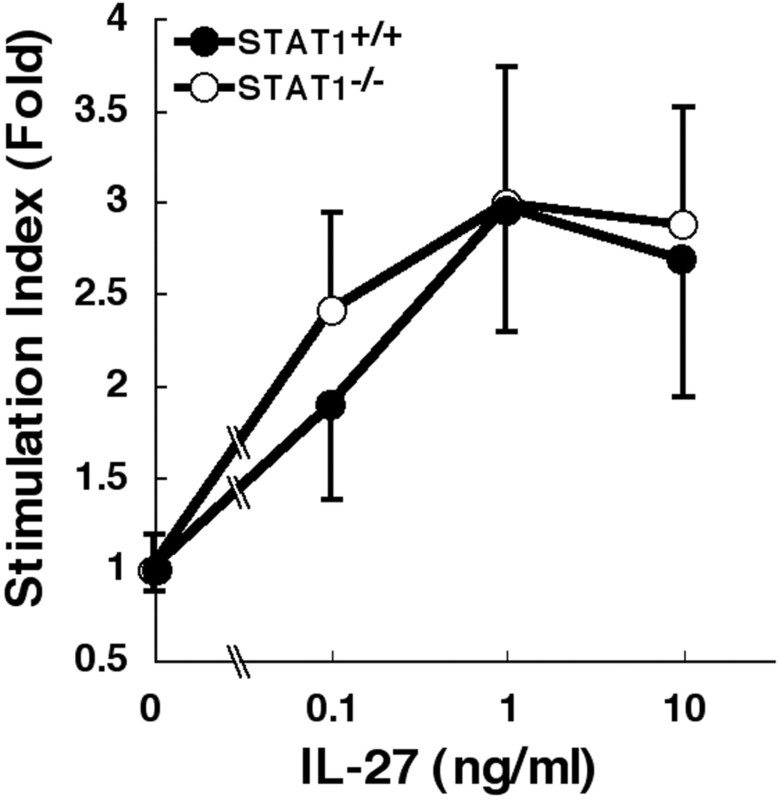 IL-27 and IFN-α signal via Stat1 and Stat3 and induce T-Bet and IL-12Rβ2 in naive T cells. J. Interferon Cytokine Res. 23:513. Larner, A. C., M. David, G. M. Feldman, K. Igarashi, R. H. Hackett, D. S. Webb, S. M. Sweitzer, E. F. Petricoin, III, D. S. Finbloom. 1993. Tyrosine phosphorylation of DNA binding proteins by multiple cytokines. Science 261:1730. Finbloom, D. S., K. D. Winestock. 1995. IL-10 induces the tyrosine phosphorylation of tyk2 and Jak1 and the differential assembly of STAT1 α and STAT3 complexes in human T cells and monocytes. J. Immunol. 155:1079. Muller, M., J. Briscoe, C. Laxton, D. Guschin, A. Ziemiecki, O. Silvennoinen, A. G. Harpur, G. Barbier, B. A. Witthuhn, C. Schindler, et al 1993. The protein tyrosine kinase JAK1 complements a mutant cell line defective in the interferon-α/β and γ signal transduction pathways. Nature 366:129. Velazquez, L., M. Fellous, G. R. Stark, S. Pellegrini. 1992. A protein tyrosine kinase in the interferon α/β signaling pathway. Cell 70:313. Fu, X. Y., C. Schindler, T. Improta, R. Aebersold, J. E. Darnell, Jr. 1992. The proteins of ISGF-3, the interferon α-induced transcriptional activator, define a gene family involved in signal transduction. Proc. Natl. Acad. Sci. USA 89:7840. Schindler, C., X. Y. Fu, T. Improta, R. Aebersold, J. E. Darnell, Jr. 1992. Proteins of transcription factor ISGF-3: one gene encodes the 91- and 84-kDa ISGF-3 proteins that are activated by interferon-α. Proc. Natl. Acad. Sci. USA 89:7836. Watling, D., D. Guschin, M. Muller, O. Silvennoinen, B. A. Witthuhn, F. W. Quelle, N. C. Rogers, C. Schindler, G. R. Stark, J. N. Ihle, et al 1993. Complementation by the protein tyrosine kinase JAK2 of a mutant cell line defective in the interferon-γ signal transduction pathway. Nature 366:166. Shuai, K., C. Schindler, V. R. Prezioso, J. E. Darnell, Jr. 1992. Activation of transcription by IFN-γ: tyrosine phosphorylation of a 91-kD DNA binding protein. Science 258:1808. Pflanz, S., L. Hibbert, J. Mattson, R. Rosales, E. Vaisberg, J. F. Bazan, J. H. Phillips, T. K. McClanahan, R. de Waal Malefyt, R. A. Kastelein. 2004. WSX-1 and glycoprotein 130 constitute a signal-transducing receptor for IL-27. J. Immunol. 172:2225. Lutticken, C., U. M. Wegenka, J. Yuan, J. Buschmann, C. Schindler, A. Ziemiecki, A. G. Harpur, A. F. Wilks, K. Yasukawa, T. Taga, et al 1994. Association of transcription factor APRF and protein kinase Jak1 with the interleukin-6 signal transducer gp130. Science 263:89. Stahl, N., T. G. Boulton, T. Farruggella, N. Y. Ip, S. Davis, B. A. Witthuhn, F. W. Quelle, O. Silvennoinen, G. Barbieri, S. Pellegrini, et al 1994. Association and activation of Jak-Tyk kinases by CNTF-LIF-OSM-IL-6 β receptor components. Science 263:92. Heinrich, P. C., I. Behrmann, G. Muller-Newen, F. Schaper, L. Graeve. 1998. Interleukin-6-type cytokine signalling through the gp130/Jak/STAT pathway. Biochem. J. 334:(Pt. 2):297. Stark, G. R., I. M. Kerr, B. R. Williams, R. H. Silverman, R. D. Schreiber. 1998. How cells respond to interferons. Annu. Rev. Biochem. 67:227. Bach, E. A., M. Aguet, R. D. Schreiber. 1997. The IFN-γ receptor: a paradigm for cytokine receptor signaling. Annu. Rev. Immunol. 15:563. Goodbourn, S., L. Didcock, R. E. Randall. 2000. Interferons: cell signalling, immune modulation, antiviral response and virus countermeasures. J. Gen. Virol. 81:2341. Siegal, F. P., P. Fitzgerald-Bocarsly, B. K. Holland, M. Shodell. 2001. Interferon-α generation and immune reconstitution during antiretroviral therapy for human immunodeficiency virus infection. AIDS 15:1603. Van Snick, J.. 1990. Interleukin-6: an overview. Annu. Rev. Immunol. 8:253. Hirano, T.. 1998. Interleukin 6 and its receptor: ten years later. Int. Rev. Immunol. 16:249. Yoshimoto, T., K. Okada, N. Morishima, S. Kamiya, T. Owaki, M. Asakawa, Y. Iwakura, F. Fukai, and J. Mizuguchi. Induction of IgG2a class switching in B cells by IL-27. J. Immunol. In press.